Are you thinking about buying a house this year? We’ve got tools and resources that will help you get your financial house in order as you prepare to look for that perfect place to call home—and shop for a mortgage that’s right for you. Just as in 2017, the supply of homes for sale is expected to remain low in 2018. Fewer homes for sale can drive up home prices and competition. There are things you can do to be more prepared to put an offer on the home that’s right for you and make sure you successfully close on your new home. Our homebuying tools and resources will help you know what to expect—and what questions to ask—at each step in the homebuying process. You can start your journey off right by getting familiar with your finances and your credit. Your first step should be to check your credit. An error on your credit report can stop you from getting the best rate you’re eligible for when you borrow money. With a 30-year mortgage, a higher interest rate will really add up over time. If you do find an error on your credit report, follow these steps to dispute the error. The median down payment in 2017 was ten percent. Generally speaking, you’ll get the best terms and rates with a down payment of 20 percent or more. However, many people can’t afford to put down that much. Assuming a purchase price of $200,000, a 20 percent down payment would be $40,000. Even if you can afford a hefty down payment, it may not be a good way to spend all your money. You’ll also want some cash set aside for closing costs and for unexpected home repairs and other expenses after you move in. In 2017, borrowers took out more than 3 million loans with a down payment of 10 percent or less. Down payments of less than 20 percent mean that the homebuyer may need to pay private mortgage insurance (PMI) or pay more interest on a loan. One of the most important early decisions is what to spend on your down payment; that way, you can focus your search on homes and price points that are right for you. Learn more about how to decide on your down payment amount. Our step-by-step Buying a House tool walks you through every step of the homebuying process, including exploring your loan choices and comparing offers to get the right mortgage for you. Even saving a fraction of a percent on your interest rate can save you thousands of dollars over the life of your mortgage, so it definitely pays to prepare, shop around, and compare offers. 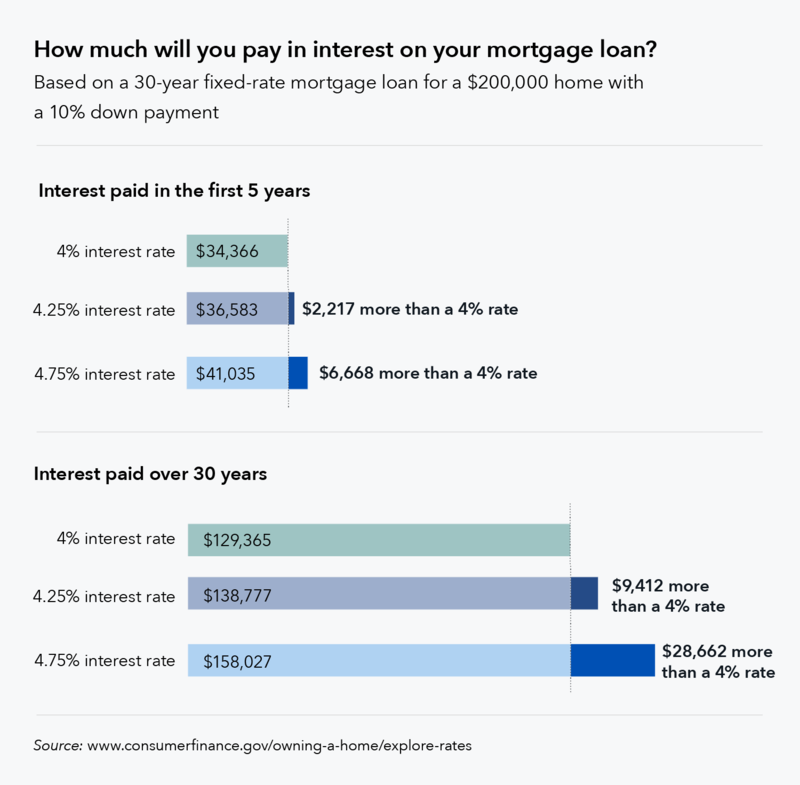 Using the example below, a 0.25 percent interest rate increase will cost you more than $2,000 in interest payments in the first five years. Over 30 years, that quarter point difference will cost you nearly $10,000. Our Explore Interest Rates tool lets you plug in some of the factors that affect your interest rate. You can see what rates you might expect—and how changes in these factors may affect interest rates for different types of loans in your area. What influences your interest rates? Read our blog post, "Seven factors that determine your mortgage interest rate," to find out. Visit our Buying a House tool to set you up for homebuying success. And make sure to sign up for our Buying a House newsletter for weekly emails.